Colchester-based wholesaler Wilsons has just been appointed by Glue Dots International as its UK distributor for the hardware and DIY trade sectors. 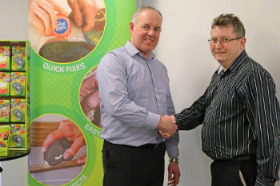 Glue Dots European key account manager Dave Angus said: “We are delighted to have appointed Wilsons who will be helping us launch our dedicated new hardware and DIY range of products throughout the UK. If anyone wants to see samples of this product please do get in touch with us and we can organise this for you. Huge potential for this product range. Works especially well for sticking posters or labels or notes to windows so really useful for putting things in your shop windows.